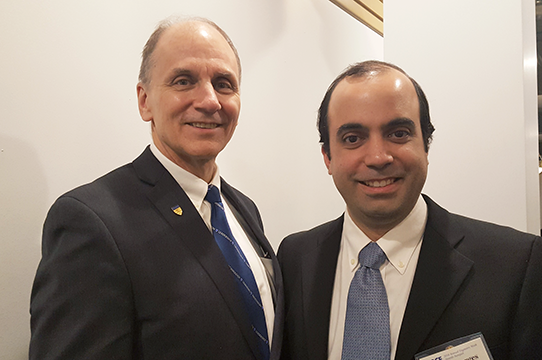 Professor Mario Berges was recently named the ASCE Pittsburgh Section 2017 Professor of the Year. Berges was recognized for his outstanding work in the classroom as well as a mentor for undergraduate and graduate students. He has also made significant contributions to the advancement of civil and environmental engineering through his research. Berges’s research centers on the development and application of information and communication technologies to increase the autonomy and resilience of infrastructure systems. With his students, he has developed automated approaches for building energy management and anomaly detection, and formalizing approaches to support sharing sensing and actuation resources at internet scale. While much of his work focuses on buildings, Berges has also worked on infrastructure systems such as dams and pipelines. Berges has advised or co-advised 15 doctoral students, 22 masters students, and 10 undergraduate students in a research capacity. He has also made several important educational contributions within the university by developing new courses on topics such as energy and data acquisition. Berges is an outstanding educator, researcher, and professional who is passionate about the application of information and communication technologies in civil and environmental engineering and has designed his courses to ensure our students are well-equipped fro the increasing role that ICT is having in operation and management of infrastructure.